USE WHAT YOU HAVE TO WIN YOUR SALVATION – Welcome to Fr. JohnBosco's Blog! Yes! I mean that very thing you have as a gift from God – your wealth, wisdom, strength, speech, time, even your phone… Yes, I mean your phone. Great opportunities abound for us to work out our salvation from, but how many of us take notice. Let me talk about your phone, for instance. I believe that is what you are using to read this message; you use it to operate your WhatsApp and Facebook apps. At times, you are harassed with all kinds of immoral messages and pictures online – the different ways the devil advance his kingdom. Have you ever, as a child of the light, posted something good for people to read and change their evil ways? It is said that evil thrive when good men refuse to act. If you can always forward this message after reading it, instead of forwarding all those kinds of meaningless messages with lots of promises and multiple threats, that can help. Can you also learn to post two holy or inspirational pictures or videos in exchange for an immoral one you see online? (see Luke 16:1-8). 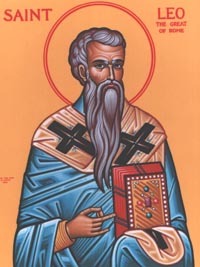 St Leo the Great, whose Memorial we celebrate in the Church today, was a charismatic leader who as a pope stood his ground against heretics that misled the people in his time. He wrote Tome of Leo to refute the errors of Eutyches in preaching that Jesus has only one nature (monophysitism) but it went a long way to instruct the faithful against being lured into error (see www.newadvent.org/fathers/3604028.htm). Modern technology offers us great opportunities to make heaven. Let us use these opportunities for the greater glory of God, and for our salvation. Amen. Have a great day, spent in wisdom and fear of God. Peace be with you.